secondly, there is a running extract from Shine Light (extract one started here, my extract is #5 of 13). 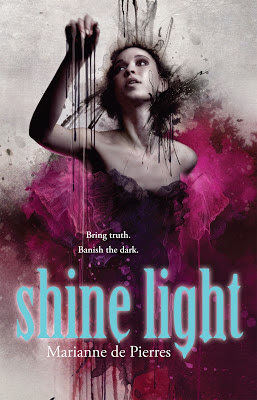 Welcome to the Shine Light blog tour. At each stop we’ll be revealing something new about the characters in Shine Light. What makes them tick? Do they have any secrets? Read on to find out . . .
Suki seems to be everyone’s favourite character; bold, funny, loyal, practical. Who wouldn’t want a friend like her? Without her Naif would have found the transition into Ixion unbearable. Suki backed her up and taught her how to laugh; showed her what a friend can be. On a personal note, Suki was a joy to create and write. I loved the idea of her coming from a matriarchal society where the males had a lower social status but were still valued because they were necessary for the continuation of the race – such a different background to Naif’s. In Naif, Suki sees an intelligent person who’s been scarred by her upbringing. She wants nothing more than to set Naif free of the chains that bind her. She also likes the fact that Naif can think her way through situations and doesn’t give in. But not everything is clear cut in Suki’s life. She’s run away from Ixion to meet up with a boy named Liam, which suggests that somehow their bonding was not considered acceptable at home on Stra’ha. This is a secret that Suki carries for the whole series and never tells anyone, even Naif. In fact, the reader won’t even realise it’s a secret unless they start to question why Suki has come to Ixion in the first place (one of my little author tricks!). Unfortunately, the pair encounters many obstacles to their simple plan and in Shine Light we find out what happens to their relationship. I hope in those scenes the readers get a glimpse into how Suki and Liam’s society works and how it has shaped them. I also hope that I’ve conveyed the depth of admiration and pride that Liam feels for Suki. She is his warrior queen. Break each code at the end of every blog post on the tour and your name will go in the draw to win a**super mystery prize** basket. Email your answers tomarianne@mariannedepierres.com. “O VOSS VQZEI YGK QSVQNL.” SOQD ZG LXAO. Markes closed his hand to make a fist and with the other picked up his cup and tooka sip of water. ‘What do you mean your badge is expiring, then?’ asked Emilia. Emilia stared open-mouthed at Ruzalia. Silence fell around the table again. Naif watched as Emilia took Markes’s hands in her own and held them tenderlyagainst her breast. ‘How long do you have?’ she whispered. ‘No!’ Emilia’s shout pierced through Naif, echoing how she felt inside.